A great way to fuel your wanderlust in between trips is to have travel inspiration and reminders in your home or office, and we’ve put together a long list of wonderful handmade travel home decor items. We have a number of travel themed home decor items in our home from rugs and coffee mugs to blankets and wall prints to photo frames and decorative globes. We’ve reviewed a wide range of handmade travel home decor items in this article for those looking for a way to express their own love for travel, searching for a gift for a special traveler, or just looking for inspiration about what types of travel themed home decoration items are out there. These handmade pieces are well-suited for a variety of spaces, budgets, and decorating tastes. We physically reviewed all these items and hope you enjoy this list of wonderful travel themed home decor items! I love travel themed items and have previously written posts on some of my favorite handmade travel themed wedding products and travel themed jewelry. I love globes, vintage maps, vacation photos, old postcards, etc. and love when I find items that incorporate travel themed elements into useful home decorations and furnishings. So we decided to put together another list on some great handmade travel themed home decor items. These include pieces for all parts of the home from the office to the bedrooms and include everything from fridge magnets and lamp shades to wall art and shower curtains. The items were also chosen to fit a wide range of decorating tastes and budgets with most items ranging in the USD $20 to $120 range. Just so you know, some of the travel home decor items in the list are items we purchased or which were given to us as gifts by others. The other travel home decor items are products that were provided by Etsy artists for review to be included in this article at our request. We physically reviewed all of these items; this is NOT just a compilation of photos we’ve pulled from the Internet. We strove to include travel home decor pieces from around the world and items came from a number of places in North America, Europe, and Asia, although the majority of items are from the United States and the United Kingdom. All of the items reviewed, to our knowledge, are handmade or hand customized items, made by a single artist, family, or a small business. We love supporting these great individual artists and small businesses, and many of the home decor pieces featured were inspired by the wanderlust and travels of the artists’ themselves! The majority of these items are truly unique and many of them can be customized to include elements that are special to you. We are happy to answer any questions you may have about any of these items included. We hope that this list helps inspire you to show your wanderlust in decorating your own home! What is It? : A ceramic 10 oz. coffee mug with ink printed brown and green travel design. 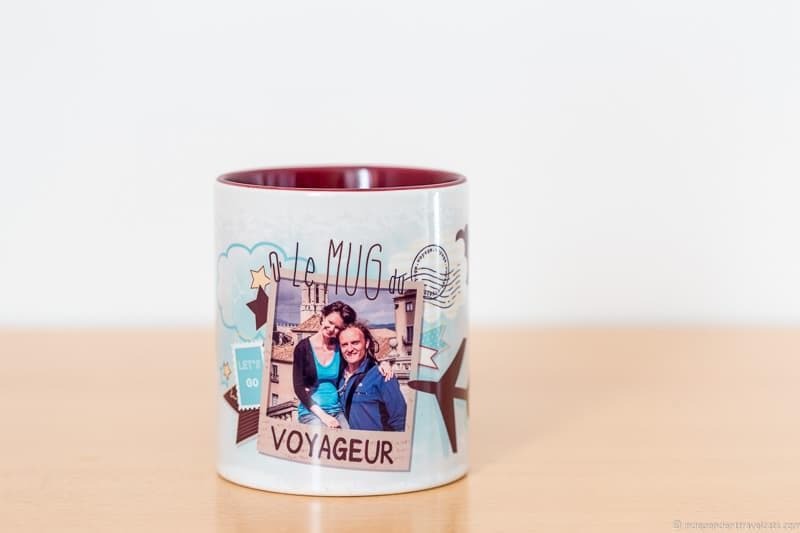 Text includes “Let’s Go” and “Le Mug de Voyageur.” The mug design can be personalized with a photo. How to Use: Personalize the mug design with a vacation photo to remind you of some of your favorite travel memories, and then use it for your morning coffee or tea. Our Thoughts: We really enjoy drinking our coffee out of this mug and seeing a photo from one of our first trips we took together in Spain. A great and practical way to remember your own travels, and would also make a great gift for a special traveler in your family. What is It? : Handmade pin boards designed to hang on the wall, made from a digitally printed cotton/poly blend matte canvas stretched around am internal frame created especially for the pin boards. Order includes 100 push pins in two colors of your choice along with the wall fixtures, 2 nails, and a mini level. 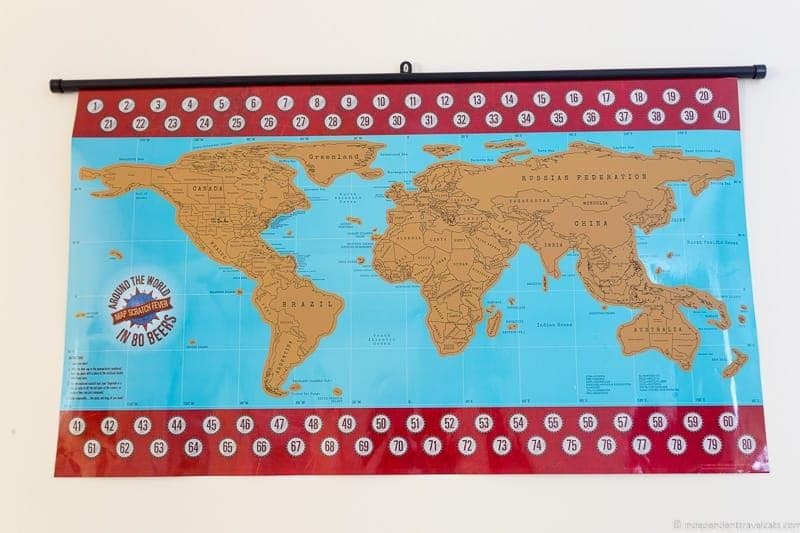 Pin boards available in world map designs as well as USA maps. Ways to Use: These pin boards are a great way to track and show the places you have visited and the places you want to go. They also make a great gift for any traveler to show where he/she has been and where they plan to go! Americans may want to check out the USA map as well. Our Thoughts: This is a very high-quality piece that is currently hanging on our apartment wall. Ross was great to communicate with and the product comes very professionally packaged and was easy to hang on the wall as it comes with all the fixtures needed so the only thing you need is a hammer to put in the nails. The push pins come in 2 colors (your choice) and we are using one set for places we’ve been together and the other for upcoming trips or wish list places. We loved that the pin colors and legend are customizable. The USA map would be perfect for those doing a USA road trip as it is obviously more detailed than the World Map version, and I also love the Ohio winery map (Ohio is my home state!). What is It? : A white metal stand and base with attachable metal signs. The stand and travel signs are made of steel and aluminum and the travel signs are printed on high quality vinyl stickers. Each starter kit comes with the base, stand, title sign, and three customized travel signs. Additional personalized travel signs can be added. Trees can also be customized for golf, ball parks, marathons, or other accomplishments. How to Use: A way to track and show your travels in a unique way, and you can keep adding to it as your list of visited cities or countries gets longer. Destinations can be cities, U.S. states, countries, or customized destinations. 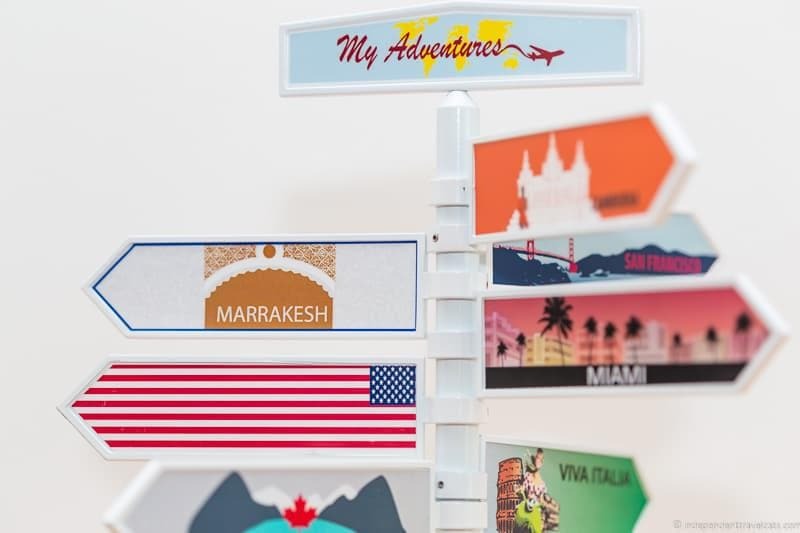 Our Thoughts: We love this unique product (it has won a design award in Australia) as it is a fun way to show off your travels. We also like that you can keep adding to it and watch as your tree grows! What is It? 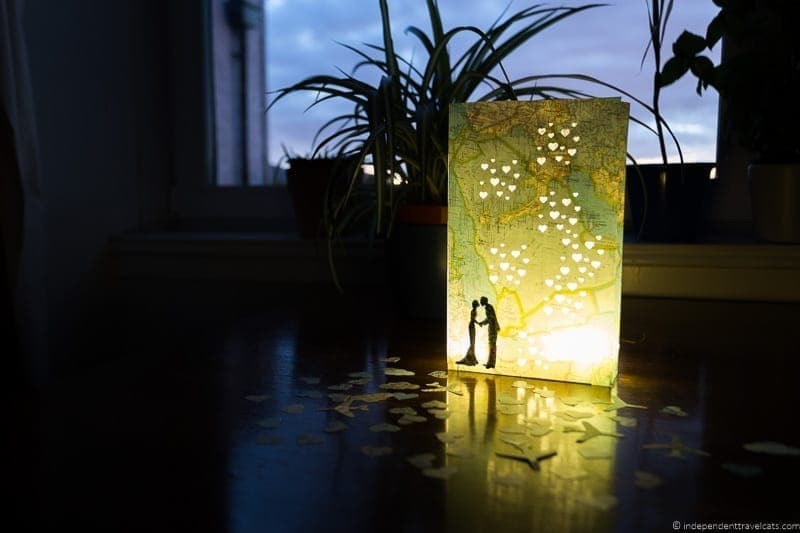 : Handmade paper luminaries made from old maps and atlases with punched shaped holes that glow when a LED candle is placed inside. These are also commonly known as candle bags and paper lanterns. Different sizes and customization available. How to Use: These can be used as table, shelf, or window decorations in your home. They are perfect for travel-themed parties as table decorations, to light indoor or outdoor paths, or to add an atmospheric glow to an event. The ones pictured were customized for a wedding or bridal shower but these luminaries can be used for regular use or any special event. Our Thoughts: We love these bags as they remind us of luminaria in New Mexico which are a traditional holiday decoration around Christmas. The use of maps, the customized cut-out shapes, and stenciled on designs really make these stand out from any other luminaries we’ve seen. These would look so beautiful for an outdoor or evening event! Just be careful that since these are not made of flame resistant materials that you’ll want to be sure to only use battery-operated LED candles. What is It? : Throw blanket made of 100% polyester with a black and white background. Photos are sublimated into the fabric (rather than screen printed) to help prevent fading, cracking, and peeling. 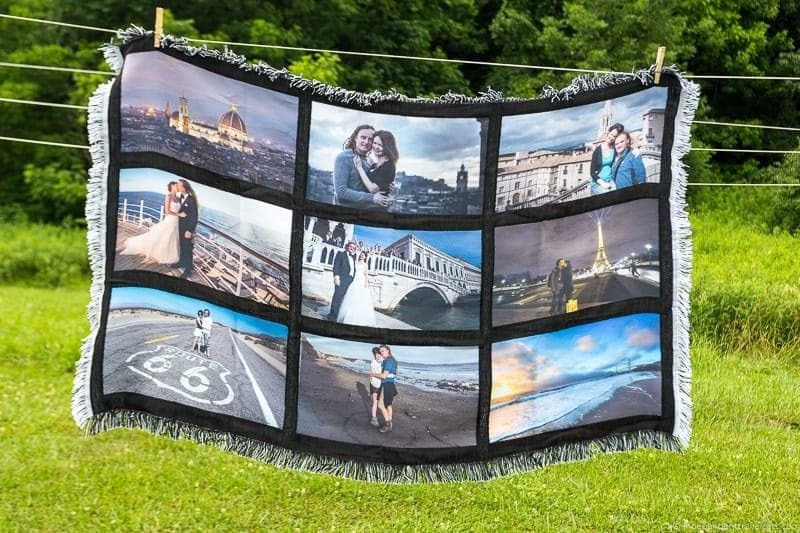 The blanket measures 35″ X 56″ and the nine panels measuring 9 inches X 16 inches can be used for nine different photos or one photo repeated. Other designs and fabrics are also available. 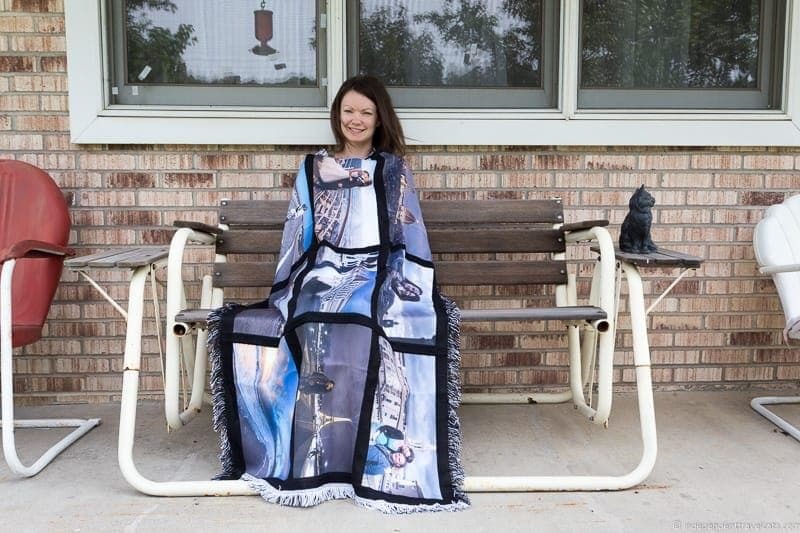 How to Use: Use this blanket to keep yourself warm on those cool nights as well as a conversation piece thrown over your favorite chair so visitors can admire your photos. Our Thoughts: We love this cuddly soft blanket as it is covered with so many treasured memories for us. Find your nine favorite vacation photos (or any type of photo!) 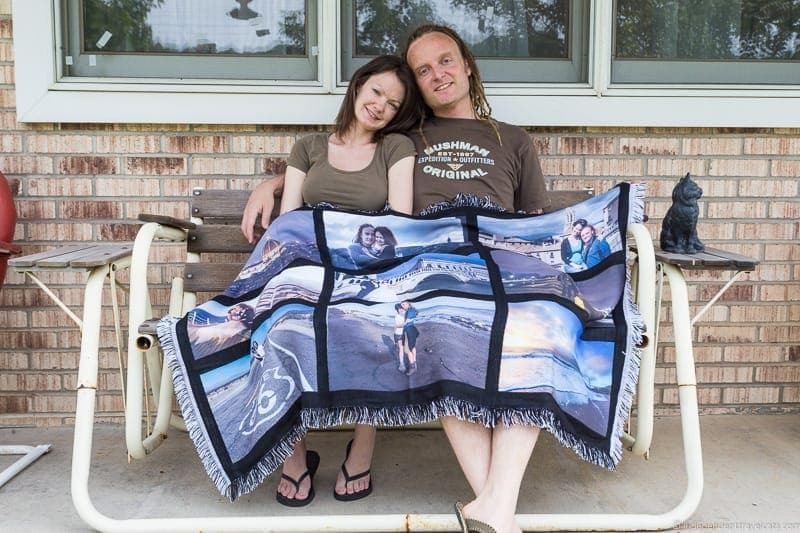 and create your own travel memories blanket, or make one for a special gift. Kristy and Nicole were lovely to work with and we saw proofs before the blanket was printed. What is It? 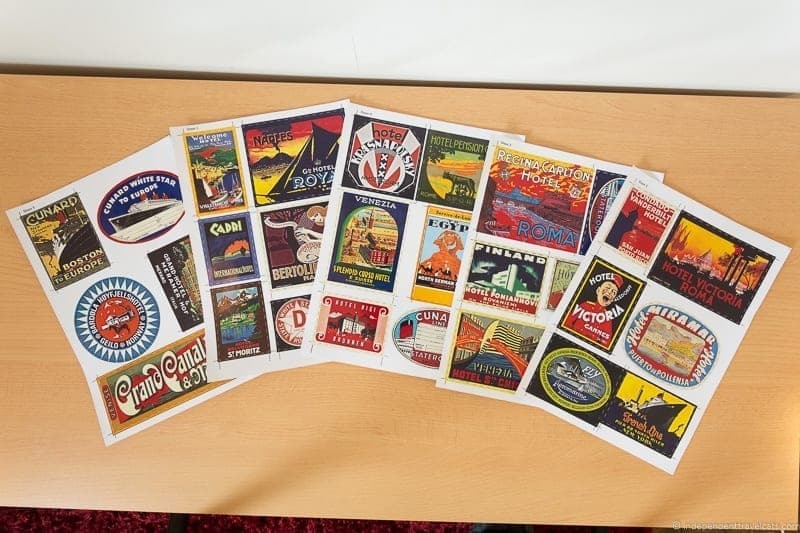 : A set of 30 reproduction retro vintage luggage label stickers advertising hotels, ships, and travel agencies that have been professionally retouched and printed on high gloss, water-resistant self-adhesive paper. How to Use: Use these retro travel stickers to decorate a vintage-style suitcase or steamer trunk for upcoming travels, decorate a piece of luggage to use for as a home decor decoration, or stick them on just about anything you’d attach a sticker. Our Thoughts: I am a bit obsessed with vintage luggage and luggage stickers so I of course was drawn to these immediately. We use these to decorate our vintage looking luggage and to also stick on the back of our laptops as we decorate them with stickers we get from our travels, so these are a perfect addition! We got married on a Cunard ship so I loved that there were a few Cunard related stickers included! 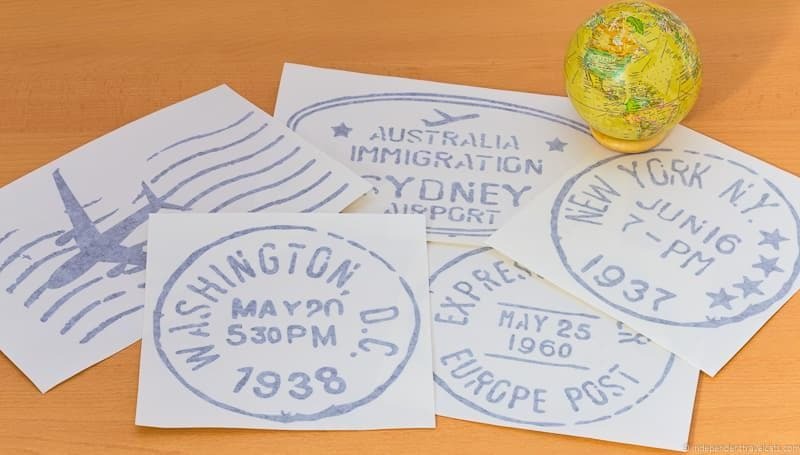 These stickers are an inexpensive way to add a retro feel to any travel-related DIY project. What is It? : Handmade small bowl made of white earthenware clay. 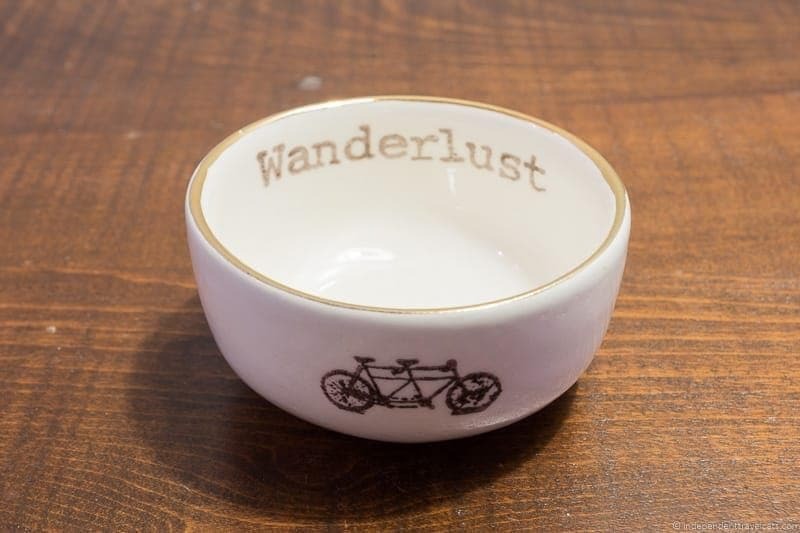 Letters and design were stamped with dark brown ink – this one has a bicycle design on outside and word “Wanderlust” along the inner rim. The bowls are fired and covered with a lead free, clear glossy glaze. Bowls can be customized with various colors and larger sizes are available. How to Use: You can use the bowl to store jewelry such as rings, earrings, or wristwatches, but it can also serve a number of other functions. For instance it could also be used to store coins, paperclips, or beads, to serve food items such as spices or sauces, to hold used tea bags, or to serve as a holder for floating candles. Our Thoughts: This little dish is really cute. 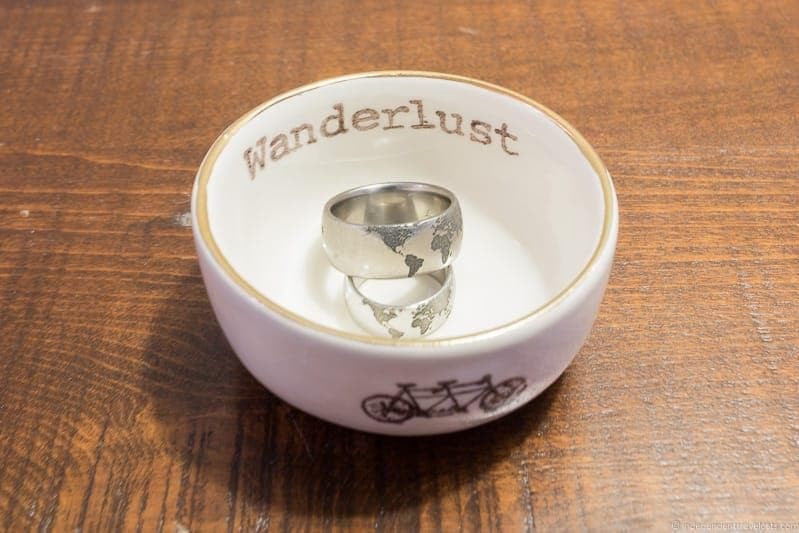 It is a great place to store my travel-themed jewelry pieces, particularly our world map wedding rings whenever we need to remove them. Elycia offers a wide range of handmade bowls in her shop that I recommend checking out, and most of her pieces can be customized! What is It? 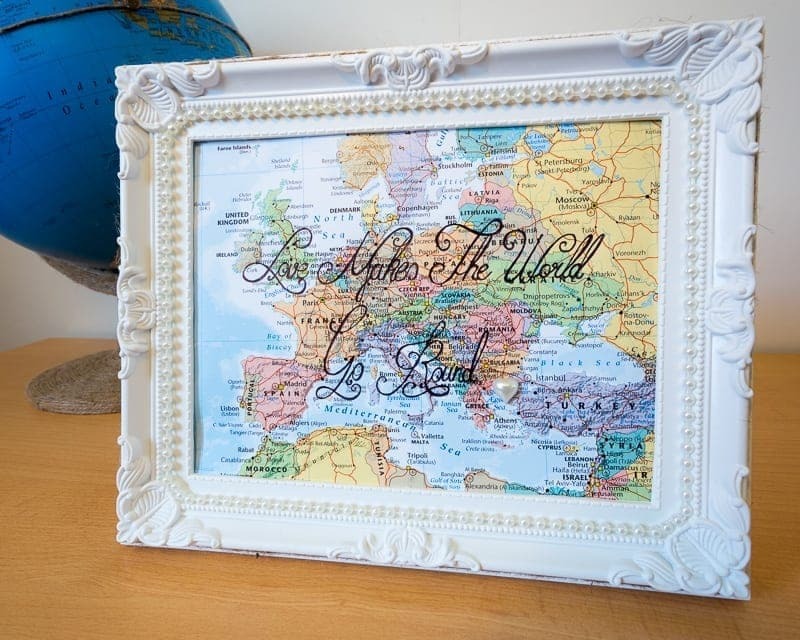 : A white frame with pearl and twine embellishments with a map that includes a handwritten quote inside. The standard quote is “Love makes the world go round.” but this can be customized to any short travel related quote. 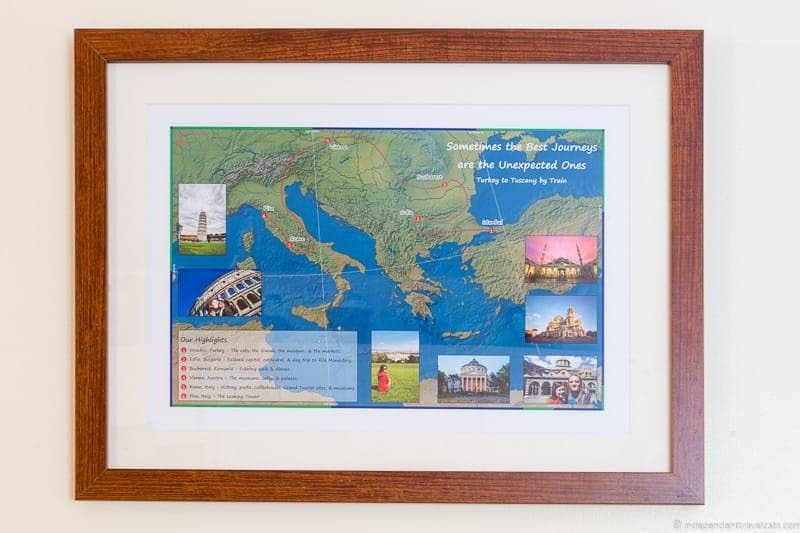 How to Use: A great decoration or gift for any travel loving person or couple. Our Thoughts: We really like how this quote combines both love and travel, two of our favorite things! What is It? 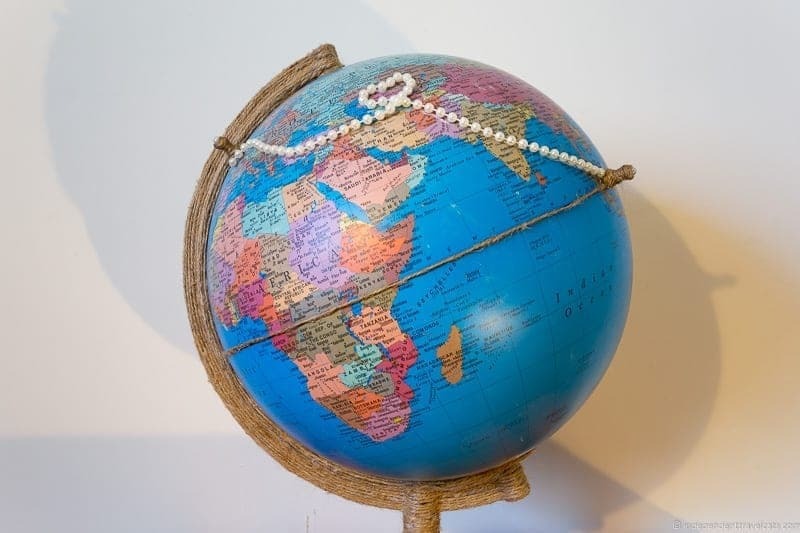 : The pictured Modern Map Globe is a standing globe with twine wrapped base and a set of pearls used to join together two (or more) locations on the globe. Pearls can be customized to join together any two or more destinations. How to Use: A statement centerpiece or table decoration that shows your love of travel and handy for looking up your next vacation destination. 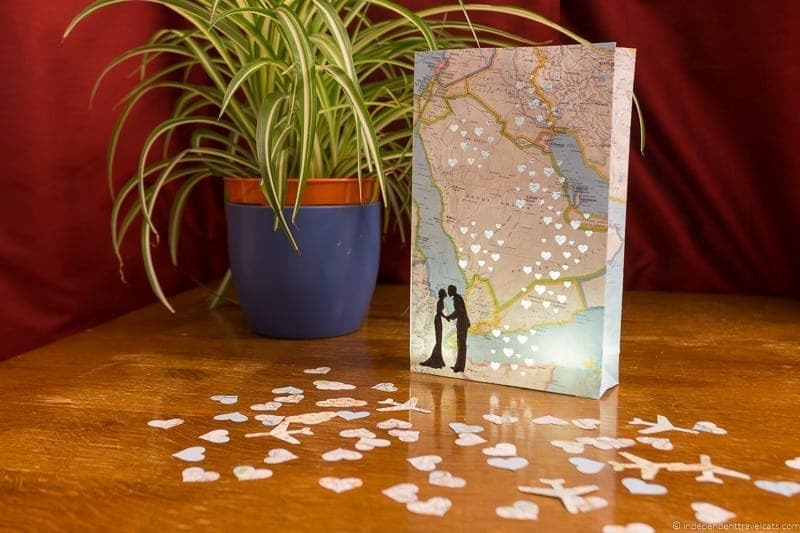 Some can be customized to show where a couple met, a honeymoon destination, hometowns, travel destinations, road trips, etc. Our Thoughts: It is hard to think of a more fitting home decoration for a traveler than a globe. I love globes and have a few in my apartment. The pictured globe is especially fitting for couples who want to show where they met. What is It? : Wall art prints that are printed on high quality matte paper. 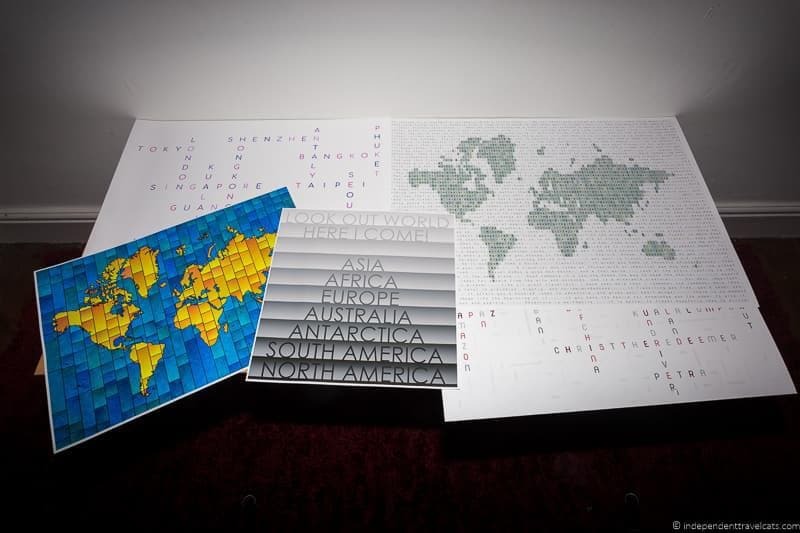 There are a number of designs available including world map prints, crossword travel map prints, travel list prints, longitude and latitude coordinates, and travel quote maps. Designs and colors are varied and many of the prints can be personalized. How to Use: A great way to decorate your walls, celebrate your past travels, and inspire your future travels. Our Thoughts: We love the wide variety of travel-related prints that Robert has available in his store. There are so many different kinds of prints available and most of them can be customized in terms of color, text, and maps so they can celebrate any sort of travel and find something to suit just about any room. Words from the Artist: “We love the magic of travelling – new sights, sounds, aromas, people, cultures, experiences, feelings – and we don’t want the memory of these things to fade. We started elevencorners to celebrate travel memories by displaying them in beautiful, interesting and very personal ways. Day-to-day life can so easily overshadow the magic of travel but a print on your wall is a constant reminder to you and a great conversation piece when friends or family come to visit. What is It? : A 1-gallon jug made of thick, durable glass with a black plastic screw cap. The world map design has been added to the jar and is made of high quality matte black vinyl. A smaller 1/2 gallon world map jar is also available. How to Use: Use the decorative jug to store your extra coins and bills as you save for your next vacation! Also makes a great gift for anyone wanting to save for a big trip. Perfect for sitting on your table, kitchen counter, or child’s dresser. Our Thoughts: We love that the jar serves both a functional purpose (place to throw loose change) and a decorative one. The product is made of high quality materials and the hole on top is big enough for any type of coin we tried. Unlike many other money storage containers, the coins were fairly easy to remove from the jar. What is It? 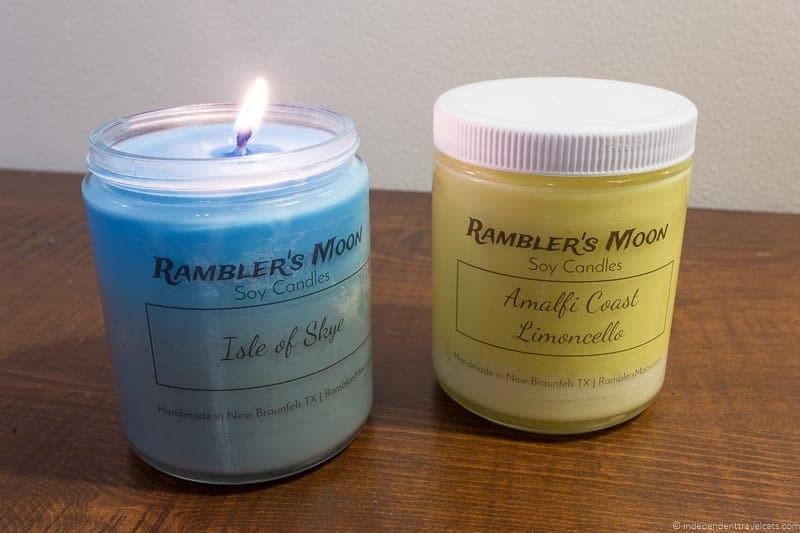 : Scented candles made with soy wax, a cotton wick, fragrance oil, and liquid dyes. They are placed in reusable 8 ounce glass jars that are about 4 inches tall and 3 inches wide. They come in a variety of travel-inspired scents. How to Use: A variety of travel related scented candles that can help remind you of past travels or help you dream of exotic places. After the candle is finished, you can reuse the glass jar. Our Thoughts: We love these soy candles as they burn for a long time and the travel-inspired scents can help you remember past travels. Smell is one of the human’s most powerful senses and scents can instantly trigger vivid memories. They can transport people back to favorite locations or help inspire future destinations. What is It? 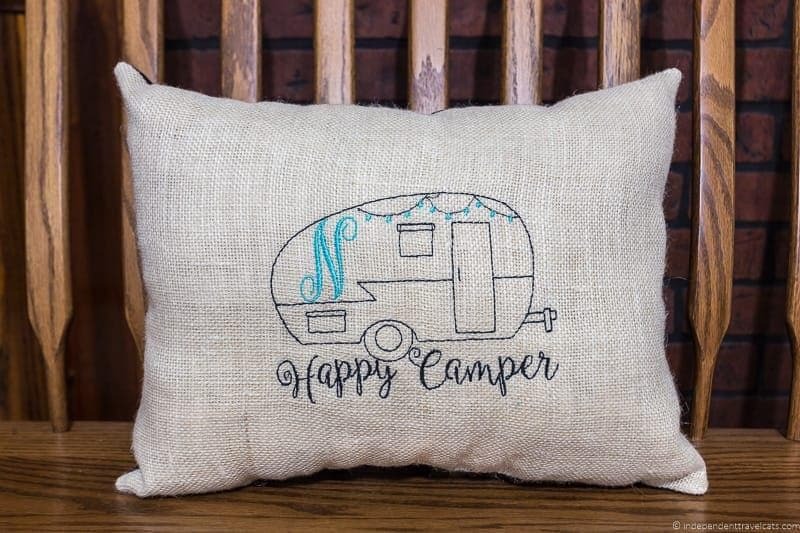 : The throw pillow has a burlap front and cotton twill backing – it is embroidered with “This is Our Happy Place” and a depiction of a camper. The dish mat is made of linen with terry cloth backing and loop for hanging that is embroidered with your initials. The kitchen towel is made of cotton waffle fabric with a lower portion of the fabric depicting a colorful camper design with the words “Home is where we park it”. All items can be personalized. How to Use: Use these items to personalize your own camper or RV. Or use them in your apartment or house to show your love of RVing or camping even when you are not out on the road! Our Thoughts: These homemade items are all of very high quality and we love that almost all of Sharon’s items can be personalized with your initials, names, or special colors. These items are perfect for those who love to RV. What is It? : A beige wooden photo frame with an engraved island vacation design and personalized elements. Picture frames include stand for tabletop display and hook for wall hanging display. Photo frames can be personalized and customized and many designs are available. 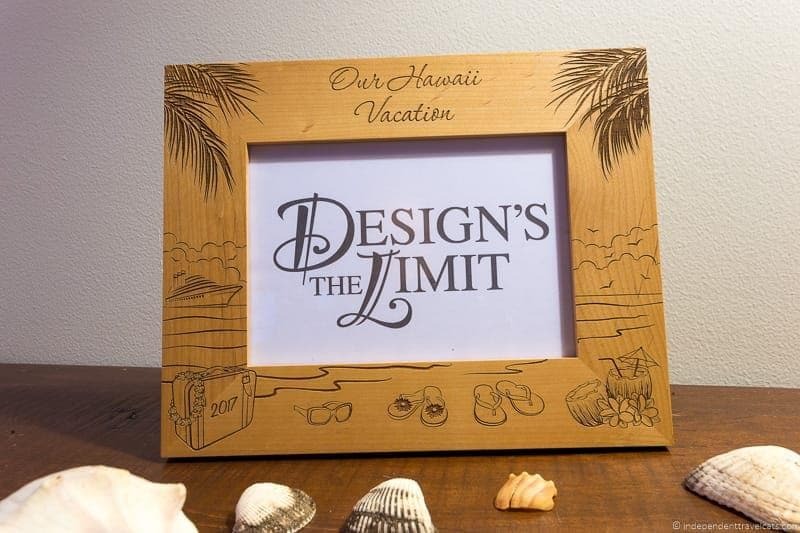 How to Use: Use these personalized wooden frames to proudly show off your best vacation photos in your home or office. Our Thoughts: We love taking the time to print some of our best travel photos and displaying them in our home so we can look at them every day. These personalized frames are a special way to display them. There are a lot of different vacation related designs available. What is It? : The banner is made with digital map designs printed on heavy 130 lb white card stock and strung on light blue jute twine. The letters spell “Be Adventurous”. The text can be personalized or it can be printed without text. 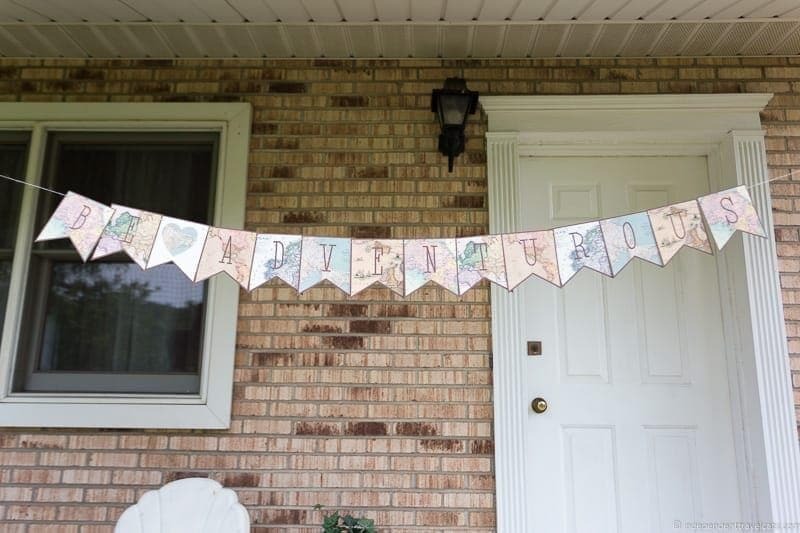 How to Use: The banner is a perfect decoration for a travel themed party, anniversary, bridal shower, going away party, or welcome home celebration. Depending on the text you choose, it can also be used for everyday use and hung in a nursery, bedroom, or lounge. 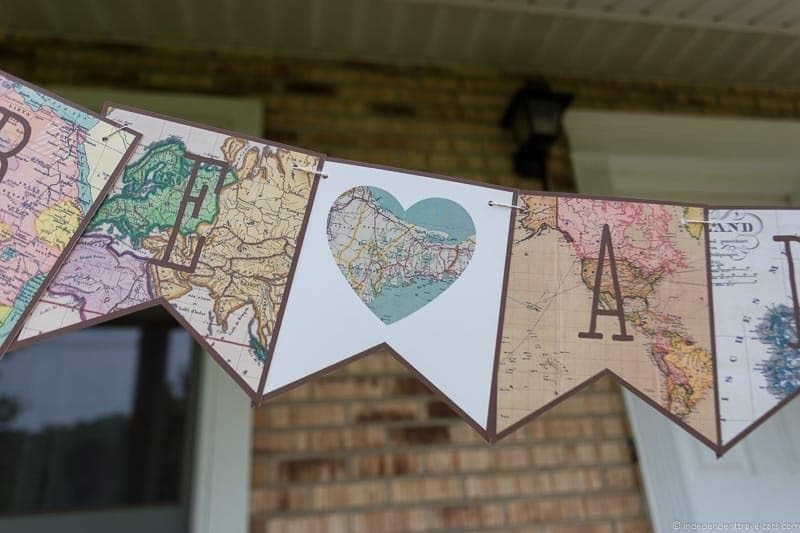 Our Thoughts: We love anything map related and this is a fun way to make a statement during a special celebration or to just say how much you love travel and adventure! This is well made but not weather-proof so I would recommend hanging it inside or if hanging it outside (such as for an outdoor party), choose a place where it won’t be exposed to moisture or high winds. What is It? : Decals are made of high quality, self-adhesive, matte-finish vinyl. The pictured designs are vintage passport travel and mail stamps. Available in a number of colors and sizes, and decals can also be customized. How to Use: These removable decals can be applied to many types of clean, flat (or lightly textured), and dry surfaces such as walls, doors, windows, mirrors, wood, and plexiglass. 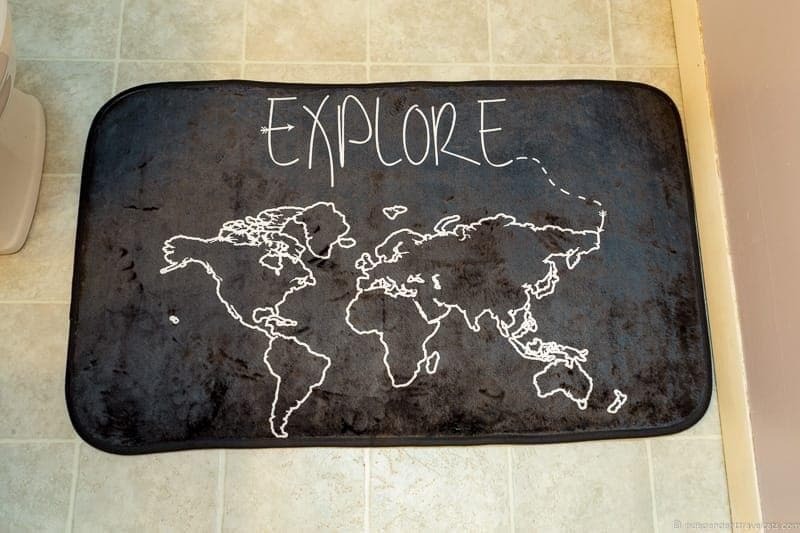 A great way to decorate a room, wall, or small space to show off your love for travel. 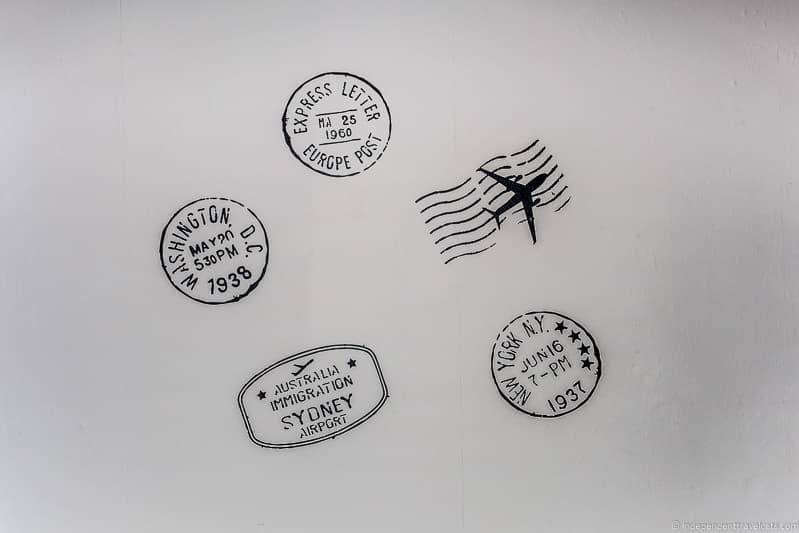 Our Thoughts: We applied these in our bedroom and love seeing the vintage travel stamps every morning when we wake up! Be sure to read the directions carefully beforehand as this particular design includes a number of tiny elements – we applied them slowly and had no problem. We used a credit card to help with the application. Adam and Kim have a number of other great travel-related wall decals as well! What is It? : A printed map covered with high quality laminate and a foil layer. 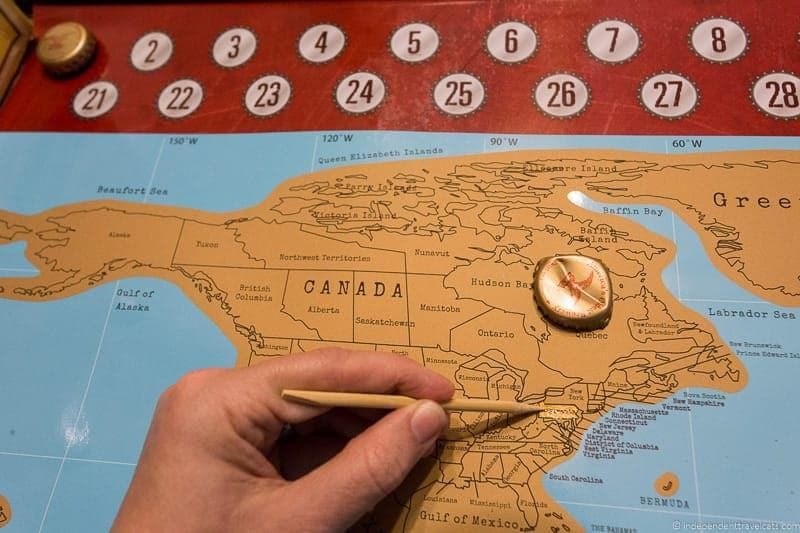 The map has a total of 80 blank circles (40 on top and 40 on bottom) that are used to stick on beer caps. 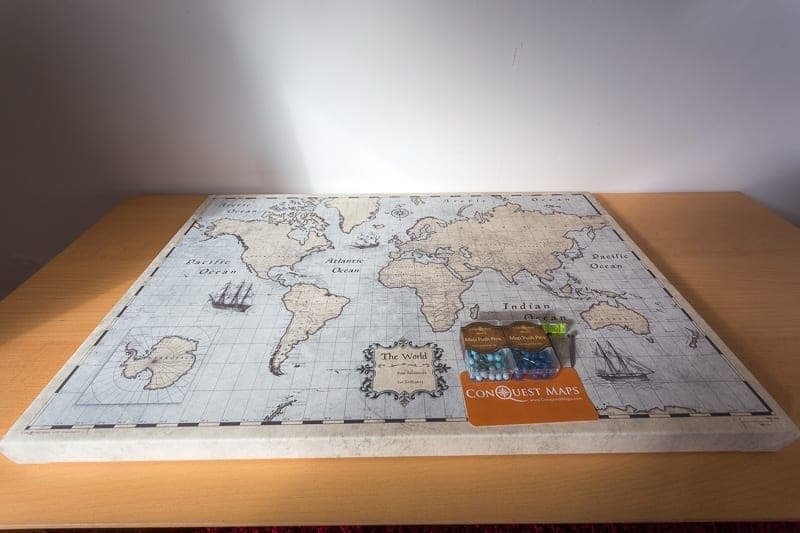 Includes a magnifier to help find the smaller countries and islands, a scratcher to help remove the foil level, and 80 sticky squares to attach the beer caps to the map. How to Use: You hang the map and then each time you drink a beer scratch off the beer’s country of origin and then attach the beer cap. 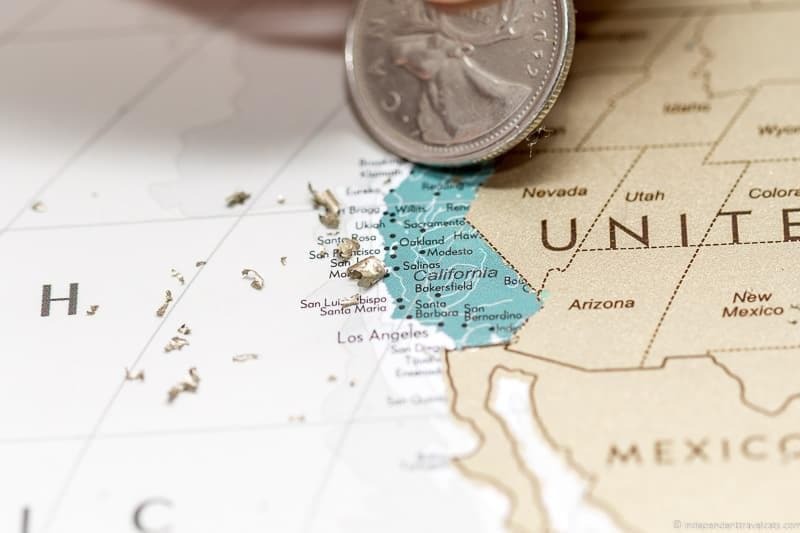 In addition to all the countries, the map also allow you to scratch off each of the U.S. states, Canadian provinces, and Australian territories individually. Our Thoughts: This is a fun way to play Around the World in 80 Beers and helps encourage you to try new beers. A great gift for any beer drinker or a fun item to have at a craft beer party! We started off our map with a beer from the oldest operating brewery in the United States (Yuengling in Pennsylvania in case you were wondering! ), and this is going to be a gift for my brother. What is It? : A wooden pencil holder covered with a map and then varnished. The pictured map includes part of the United Kingdom and France. You can customize the map location. How to Use: Use the pen pot to hold and organize all the office supplies on your desk like pens, pencils, markers, and scissors. 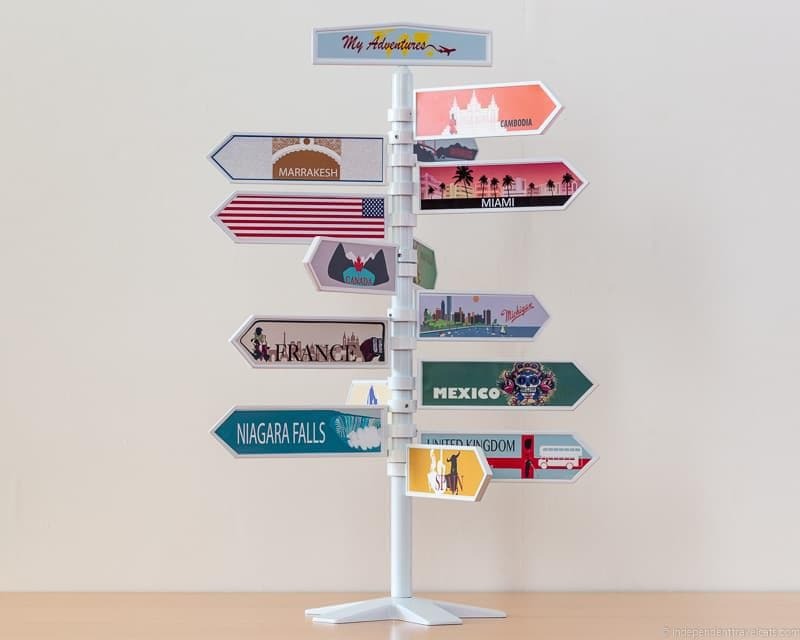 Our Thoughts: A great way to bring some travel themed elements to your desk at home or at work. We love that you can customize the location so that you can choose a map location or country that is special to you! 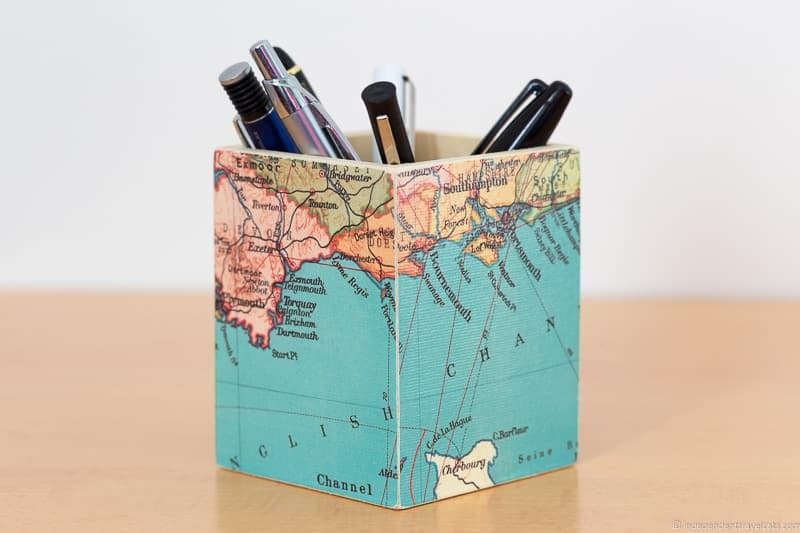 Kerry also sells a number of other map decoupage pieces such as tissue boxes, jewelry boxes, and decorative letters. What is It? : Glass magnets with real paper map sections inside. Magnets come in various sizes and shapes, including round, square, and heart designs. Map locations can be customized and magnets are made to order. How to Use: Place these on your refrigerator, dry erase board, filing cabinets, and other magnetic surfaces in your home and office to remind you of your favorite places. Also make great party favors. Our Thoughts: We love that you can pick your favorite locations in the world (places you’ve been or places you want to go) and be reminded each time you open your refrigerator door! What is It? : Spruce pine wood sign with white handpainted world map design that has been varnished and sealed. Signs come with metal hardware attached to hang on the wall. The sign shown is 25 inches L X 14 inches W. Various sizes and varnishes available, and signs can be customized. How to Use: Hang on your wall in your bedroom, entryway, living room, nursery, or kitchen. It comes with all the necessary hardware attached so you just need to grab a hammer and choose the wall! Our Thoughts: We love this piece of rustic but elegant travel home decor that can be used in just about any room of the house. It was easy to hang and we were glad we did not have to attach the hardware. What is It? : Planting pot that is handpainted using low VOC chalk paint. Designs include golden and green vintage map of Ireland and nautical compass rose on the outside and green shamrock images on the inside. Pot is covered in UV protectant and 3 coats of matte water sealant. 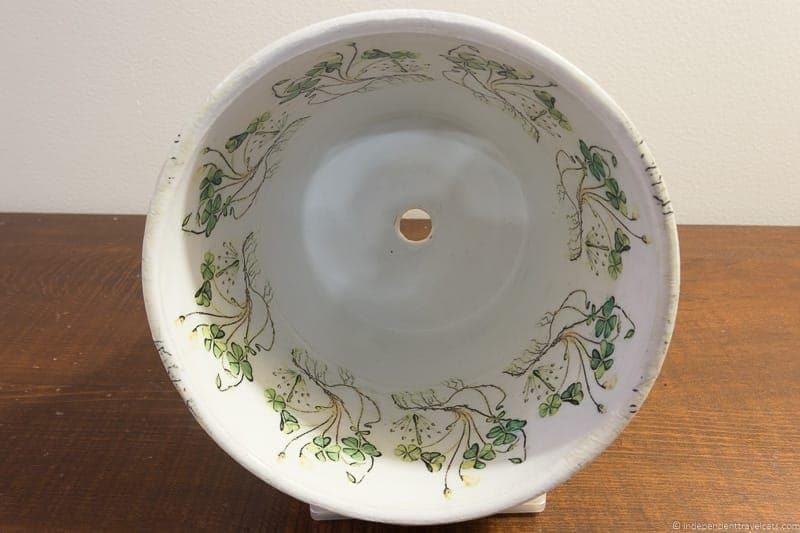 Pot is approximately 8.25″ wide at top and is 6″ tall with a bottom drainage hole. Various pot sizes are available, and design can be customized. How to Use: Plant flowers or herbs in this beautifully decorated flower pot. Can be used inside or outside. Our Thoughts: A beautiful garden pot that looks great on our window sill and reminds us of the beautiful Emerald Isle! This particular design would look great with purple flowers. What is It? : A custom design of a specific trip with map is printed on 51lb acid free paper. The design is personalized for each customer and can include text, map locations, routes, and personal travel photos. Frame not included but you can add framing to your order. How to Use: Create your own map based on a special vacation and then hang the map on your wall to always remember it. In addition to vacations, you can also use the map to chart a marathon, challenge, hike, classic road trip, or any other route. Our Thoughts: We loved how much we were able to customize the map design and Scott was able to incorporate our specific route locations, text, and even our travel photos. A great way to remember our trip and we look forward to being reminded of our European train journey every time we glance at our wall! What is It? 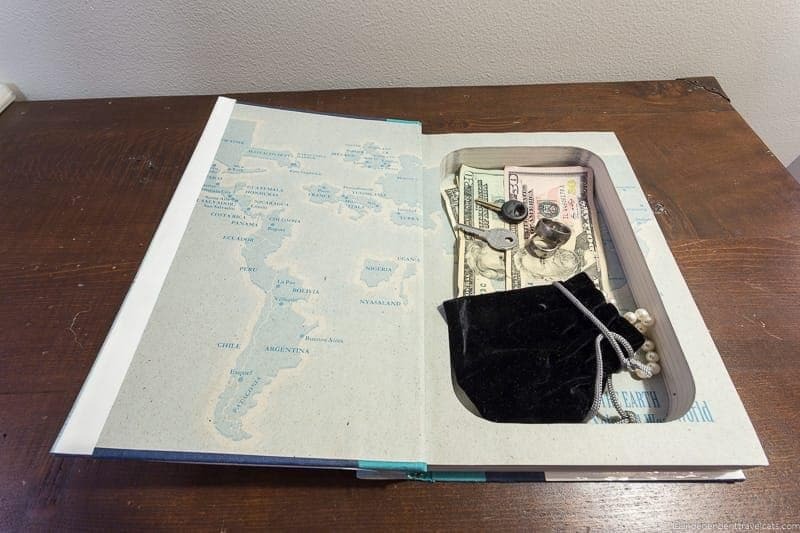 : Hardcover copy of To the Ends of the Earth: The Selected Travels of Paul Theroux with original dustcover that has been hollowed out so there is an inside opening that is 4 7/8 inches wide x 8 long x 15/16 deep. Inserted magnets keep it closed even when it is standing upright. Hollow safes available in a number of book titles (including custom requests) and size and shape of hollow can be changed. How to Use: You can use the secret book safe to protect or hide a number of objects including cash, credit cards, jewelry, passports, keys, flasks, and collectibles. Our Thoughts: We love being able to hide items in plain sight, especially in a book written by a modern travel writer which fits in well on our bookshelf. It is a great place for us to store our passports, desk keys, extra cash, and nicer jewelry that we would normally just shove in a drawer. You can store just about any smaller items in the book, but remember that the book safes are not waterproof or fireproof (e.g., don’t store your most prized possessions!) and it is also not childproof so we don’t recommend storing weapons if children live or play in your home. What is It? 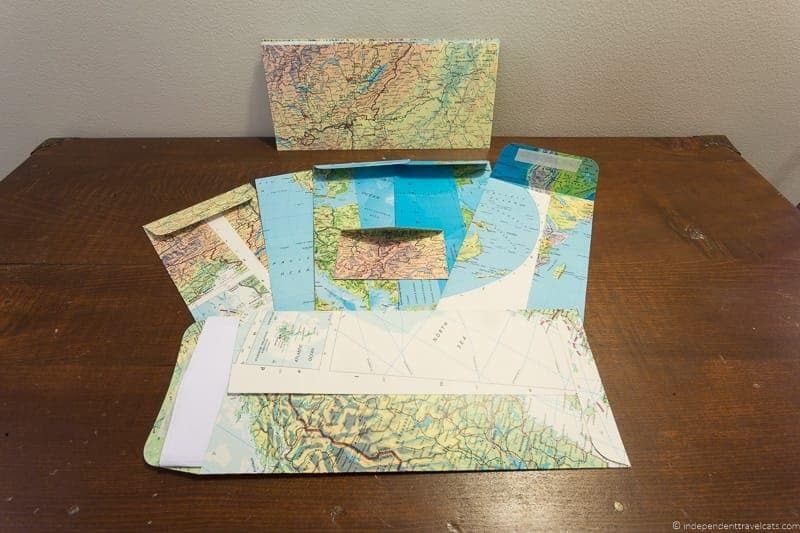 : Upcycled atlas map pages handcrafted into letter-sized envelopes. These measure 9 1/2″ X 4″ although a variety of sizes and recycles papers are available. Custom orders accepted. How to Use: Use these handcrafted map envelopes like you would any other envelopes – use them to send letters or invitations to friends and family, pay your bills, store items, etc. Consider sending an actual letter instead of an email to your friends or family during your next vacation! 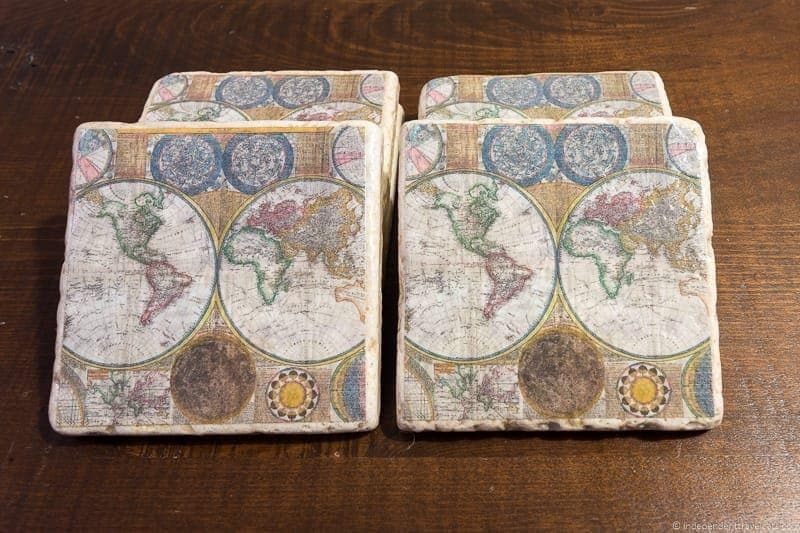 Our Thoughts: We love that these are so well-made and are also making good use of discarded atlases and maps. I still write letters to my grandmother and these travel themed envelopes make it more fun to send a letter. What is It? : Ceramic 11 oz. coffee mug with ink printed map design and high gloss glaze finish. Available as both a regular white map mug as well as a color changing mug. 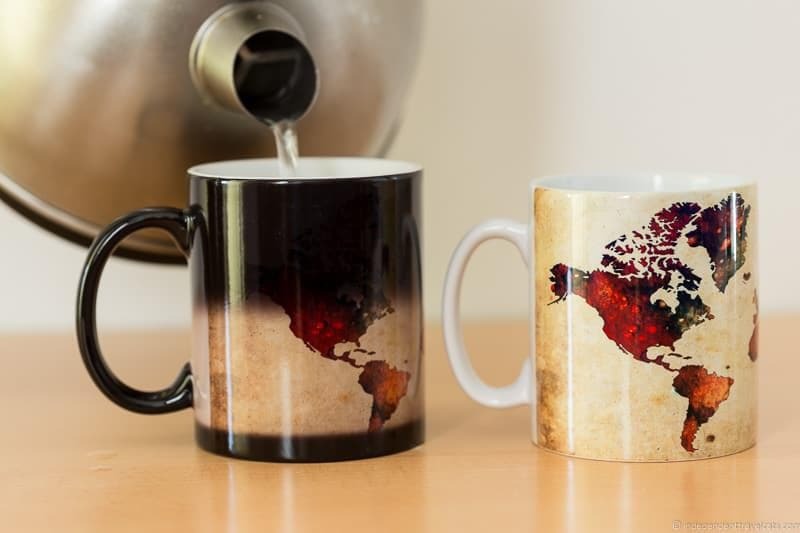 How to Use: The color changing mug goes from being a plain black mug to showing the world map design when hot liquid is poured into it. The color changing mug is not dishwasher safe. Our Thoughts: We had great fun pouring hot water for tea into the mug and watching the map design appear. Would make a great gift as well. Svetla has a number of mug designs in her shop as well as many wall art pieces that include skyline, cityscape, and map designs. What is It? : Map printed on high quality paper then covered with a gold foil layer that can be scratched off. Map shows over 10,000 cities and places you can mark and package also includes a dust cloth, push pins, and metal scraper. Map measures 34.6 inches X 23.6 inches (88 X 60 cm). How to Use: Use this fun high-quality map to show the places you have visited in the world by scratching off visited countries and marking destinations with push pins. Our Thoughts: This is a great map and a fun way to show where you have traveled in the world. It can also help you decide on your next vacation destination. Map is very detailed for its size and it was easy to scratch off the gold foil level. Individual U.S. states, Canadian provinces, and regions of large countries can also be distinguished so you can scratch off certain areas rather than the entire country. What is It? : Handsewn pillow case made from weather- and fade-resistant 100% spun polyester poplin fabric. 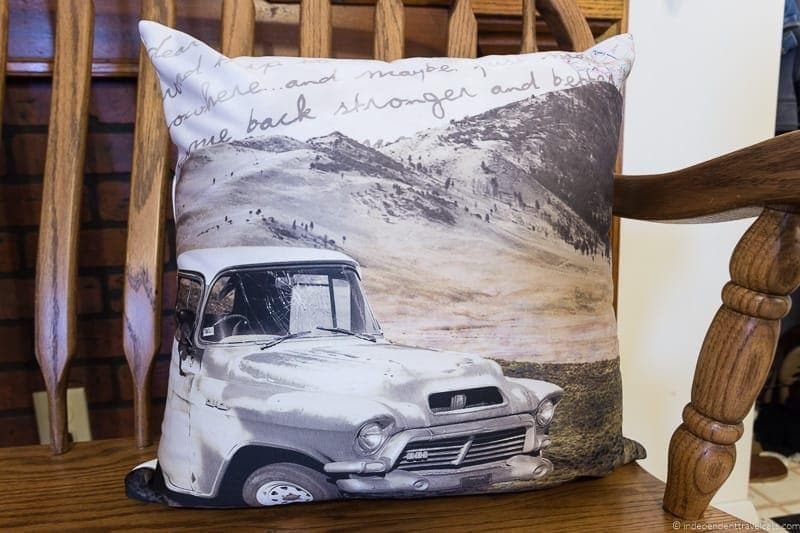 Pillow case has double-sided print of a truck and mountains on it and has a concealed zipper. Includes faux down pillow insert. Different sizes and customized orders are available. How to Use: A great pillow to show your love of travel that can be used in your indoor or outdoor seating areas! Our Thoughts: We love that you can get a throw pillow featuring a lovely travel or nature photo or design by the artist. Katya also makes a number of other handcrafted items with travel and nature photos including phone cases, shower curtains, wall tapestries, duvet covers, and travel journals. What is It? : The map design is decoupaged to the stone tile and treated with commercial grade paver sealant on both front and back to preserve the stone and image. Felt backing is applied to the bottom of the coasters. Coasters can be made of ceramic or natural stone and a number of customized elements and designs are available. How to Use: Great to use as decorative and functional drink coasters, and they can also be hung on your wall for a decoration if you’d prefer (just request that wire loops be added). 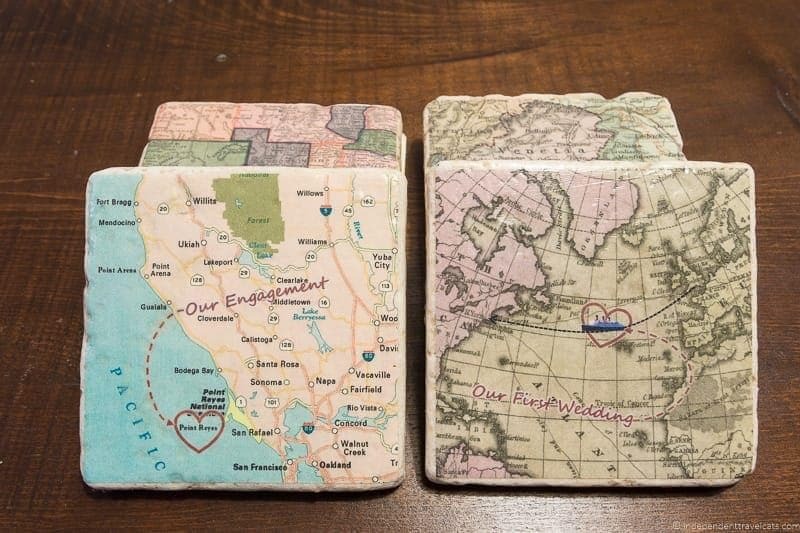 Our Thoughts: We adore the Old World style map stone coasters, but we especially love the personalized set that includes the places where we met, our first road trip, where we got engaged, where we got married, our first home together, etc. A great way to have reminders of your favorite places! These natural stone coasters are durable and of high quality. What is It? : Black bath mat made of a quick-dry microfiber surface, memory foam cushion, and skid-proof backing. Various sizes and colors available. World map design also available as a woven polyester area rug. How to Use: Place the non-skid mat next to your bath tub or shower, or buy the woven area rug to place it anywhere in your home. Our Thoughts: An easy way to add a bit of a travel theme to your bathroom. The mat is soft and easy to clean. If you love this world map design, Amanda can print the same design on a number of other items including area rugs, pillows, duvet covers, blankets, and even clothing! What is It? : Photo is printed on cotton sateen fabric and adhered to a hard plastic backing to create the lampshade. Lampshades can be made in a variety of dimensions and are designed to fit traditional harp style map fixtures. 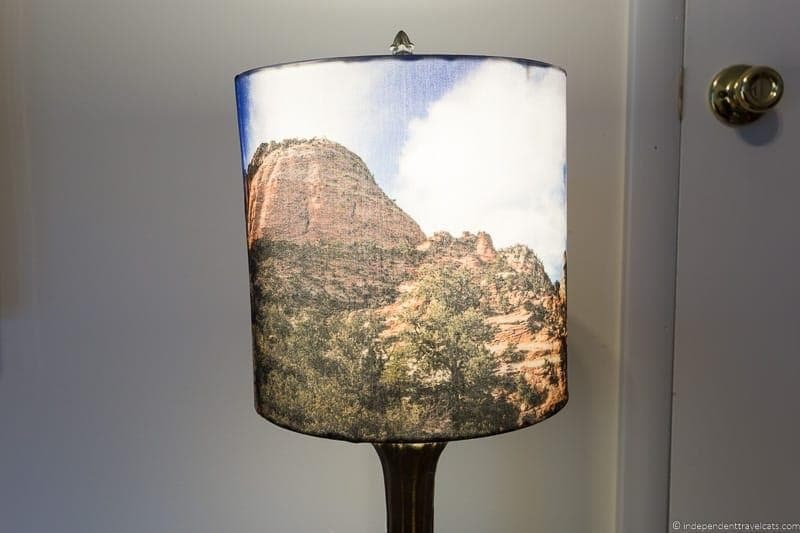 The shown lampshade features a photo from Zion National Park. A variety of designs are available, and all lampshades may be customized with you own photographic images and configured to your desired dimensions. How to Use: Place this handmade lampshade on any of your lamps to provide a unique look to your room. Our Thoughts: A great way to add an element of travel to any room. We recommend customizing a lampshade with one of your own favorite travel photos to remember a special destination or vacation memory. Kara can also use your vacation photos to make customized throw pillows. What is It? 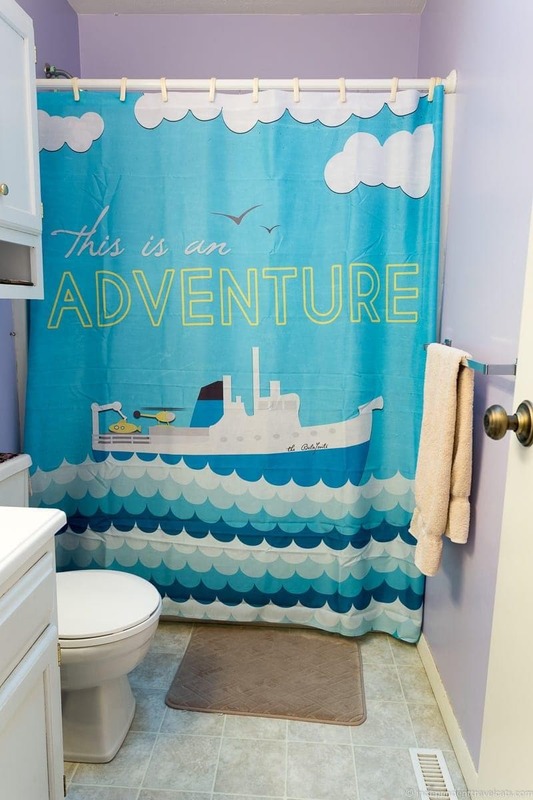 : A shower curtain made of 100% polyester with printed nautical design. The pictured shower curtain measures 71 inches (W) x 74 inches (H) with 12 button holes for shower hook placements. Shower hooks/rings not included. How to Use: Hang this up in front of your bath tub or shower to add a fun and adventurous element to your bathroom. Our Thoughts: We love this fun and colorful nautical design as we both love boats. Would look great in a variety of bathrooms! As with any fabric shower curtain, be sure to use a shower curtain liner behind it to preserve your curtain. 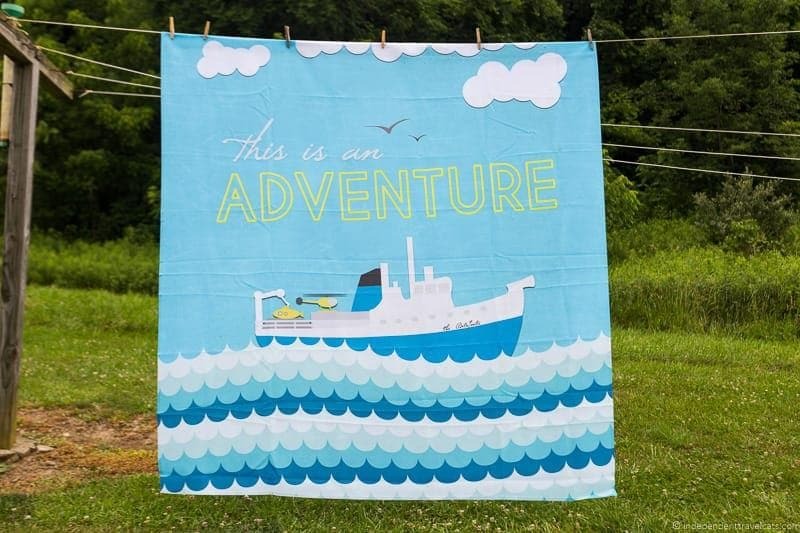 If boats aren’t you thing, you may want to take a look at Rachel and Ryan’s many other shower curtain (and other home decor item) designs! What is It? : Burlap (a.k.a. jute or hessian) fabric pillow case with cotton lining and envelop closure. Pillow case is embroidered with a country outline and heart in the location of the city of your choice. 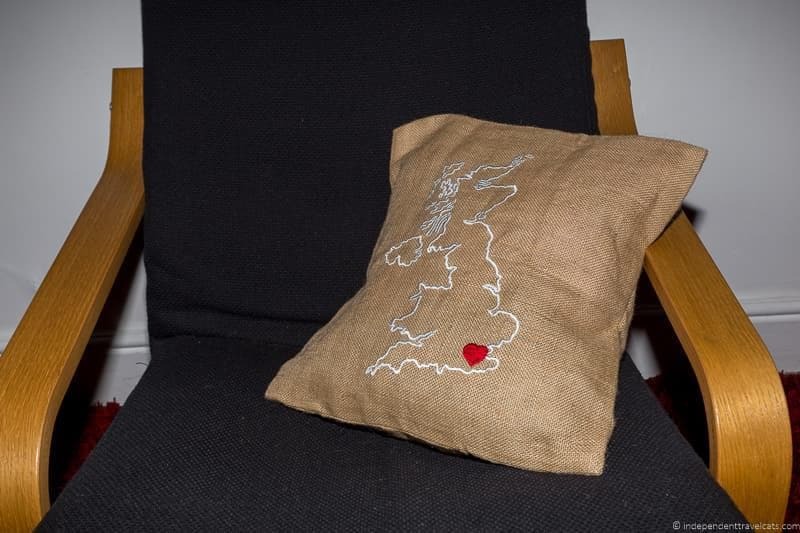 The pictured pillow case is 16 inches X 16 inches (40 cm X 40 cm) and shows the UK with the heart over London. Various pillow case sizes and designs are available. Pillow insert is not included. How to Use: Use these pillows to give a rustic look to your home and show off the places that you love. Our Thoughts: These make great decorative throw pillows that can remind you of the places that have your heart even if you can’t always be there. 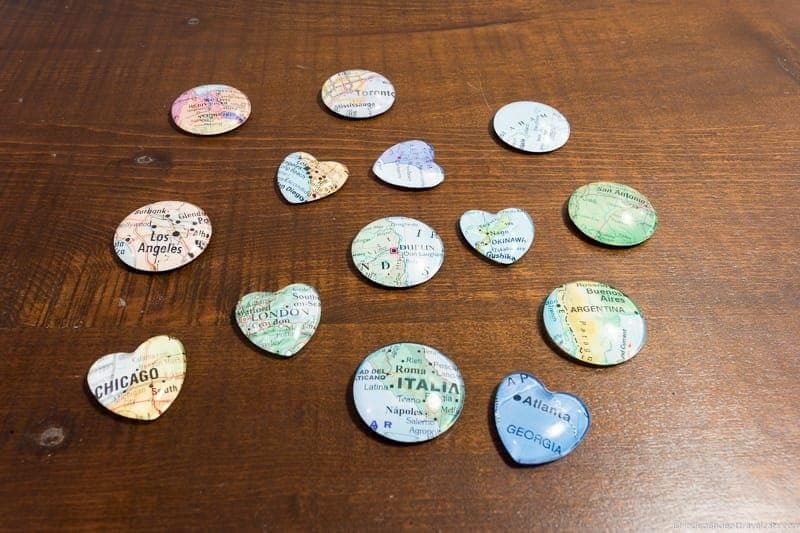 These can be customized to show any country or state, and you can decide where you want the heart to be placed. What is It? : Handmade small ceramic dishes made from clay. Designs are stamped on and then the dish is fired, glazed, and then fired again. 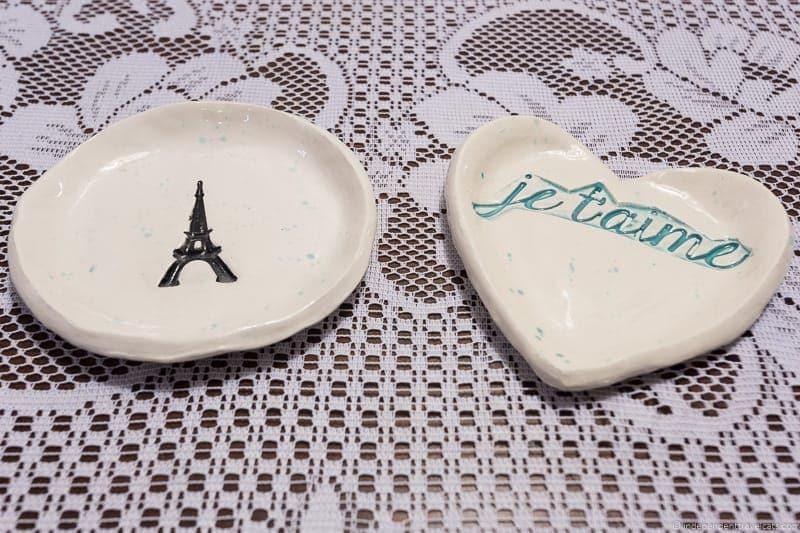 Pictured dishes have Eiffel Tower and Je t’aime (“I love you” in French) designs. Dishes are available in a variety of colors, designs, and shapes. How to Use: Ceramic dishes can be used for soap, rings, coins, candies, tea bags, etc. These would also make great party or wedding favors. 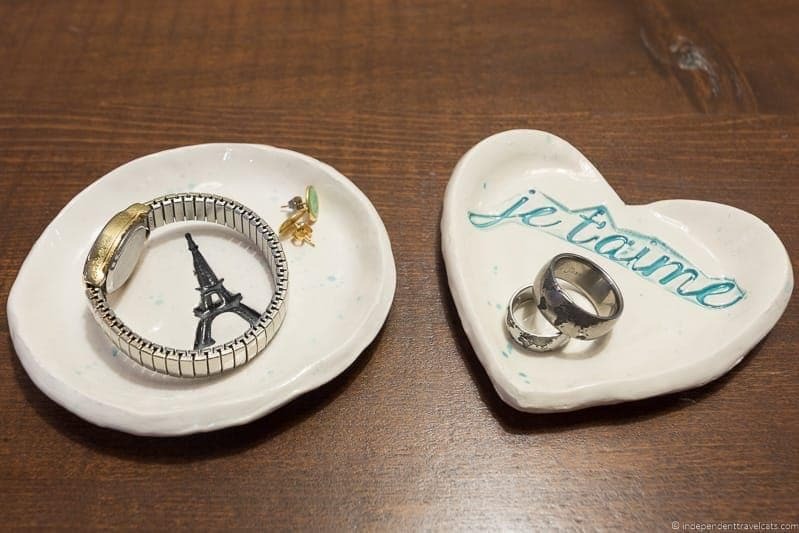 Our Thoughts: Beautiful trinket dishes for those who love France like we do! Cynthia has a number of French inspired items in her store and is happy to make custom items as well. To give back to all the readers here, I have decided to give away many of the travel home decor items I received for review. There are many items that will be given away! I am giving away 5 items and there are 26 travel home decor items for winners to choose from so you know if you win, you’ll get something you really want! Since there are so many items included in this giveaway, the giveaway will have 5 winners. 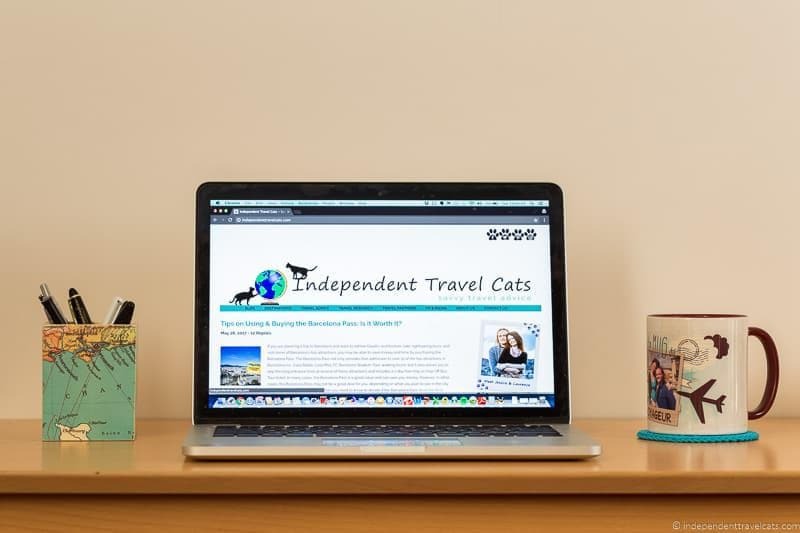 Giveaway details: Everyone who enters the giveaway needs to note the number of at least 3 travel home decor items they would like to win to be eligible to win. Noting more preferences helps better your chances of winning. Winners will be randomly drawn with the first winner guaranteed their top choice, and subsequent winners will receive one available item on their list. If a winner is chosen but all preferenced items have already been given, another winner will be chosen. Free shipping is included and I will ship internationally using standard shipping (note that if any custom charges are charged by the country of the winner, the winner is responsible for these charges). One item will be sent directly to the winner from the artist as noted below. Neither I nor the artists are responsible for items lost or damaged in the mail. The value of each item in the giveaway varies. Applicants must be 18 years or older and have a valid mailing address. Winners will be contacted by the email provided (so please use an email to enter that you check regularly); if a winner does not respond to email within 72 hours, another winner will be chosen. The items will then be shipped to an address provided by the winner. Giveaway is open internationally. The giveaway will end on July 16, 2017 at 12:00am EST. All entries will be checked for validity. Did any of these travel themed home decor items catch your eye? Do you own any travel home decor pieces yourself that you love? If you have any questions about any of these travel home decor items, just ask us and we’re happy to share our honest thoughts! I love traveling as much as I love handmade products! So whenever I travel, I make sure that I get to purchase handcrafts especially those made by local community artisans. There is just one time, I went to Chiang Mai in Thailand, I never had the chance to actually buy my souvenir, but thankfully I found a store called localbazaar who sells handmade crafts from Chiang Mai! Hello Jessica, I love this travel themed decoration and as well as items. Some of my favorite handmade travel themed are vacation photos, unique travel items and travel themed jewelry. These are really fantastic ideas to decorate. Thanks for sharing such a nice idea. I love themed travel decor as it brings the outside world into my home. 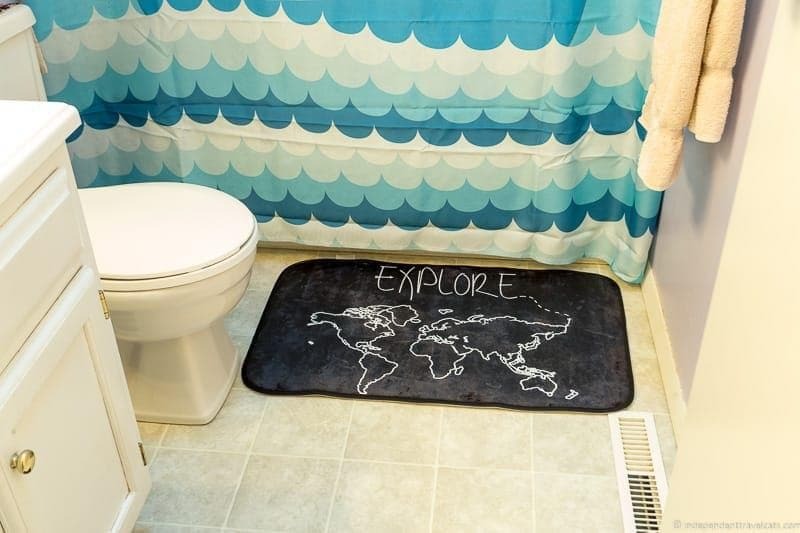 I love the Explore Bath Mat and the World Map Money Jar. I love the Travel Map Pin Board and the Framed Maps with Love Quote! I love to travel and explore places that I’ve never been to but it’s been hard to get away as I care for a special needs adult. 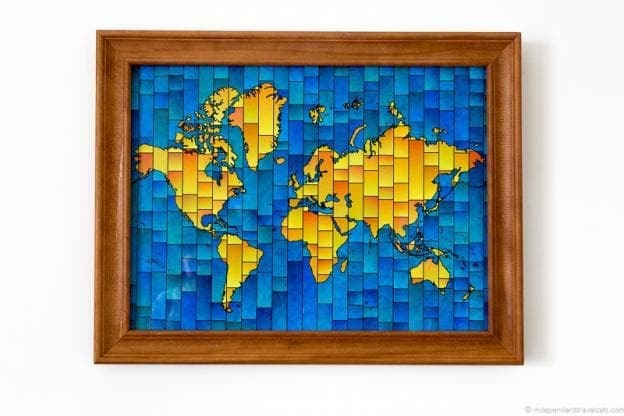 I love all the items but really love the wooden wall decor world map, thanks! I likethat the travel themed items I collect bring back memories of places and events. I like mappy type mementos. I’ve always wanted to travel the world as a kid my dream job was to be a doctor overseas. I’m a bit sad that I’ve never ventured outside of the United States. My favorite is definitely the book safe! I’ve always wanted a hollow book. My mandatory entry I hit too soon it was 17, 15, and 7. Hope I can still be entered. Love that glass world map print! Also the travel fund jug – we need a couple of those, only filled up! 😉 Great finds – thanks for sharing! My husband is in the military and we travel a lot! I love the money jug the most! The Custom Travel Themed Map Luminary is so beautiful! I would also love to have the map where I can mark the locations that I’ve been to! I like them because they remind me of where I’ve been and of where I want to go. I would love to win many of these travel themed home decor items! 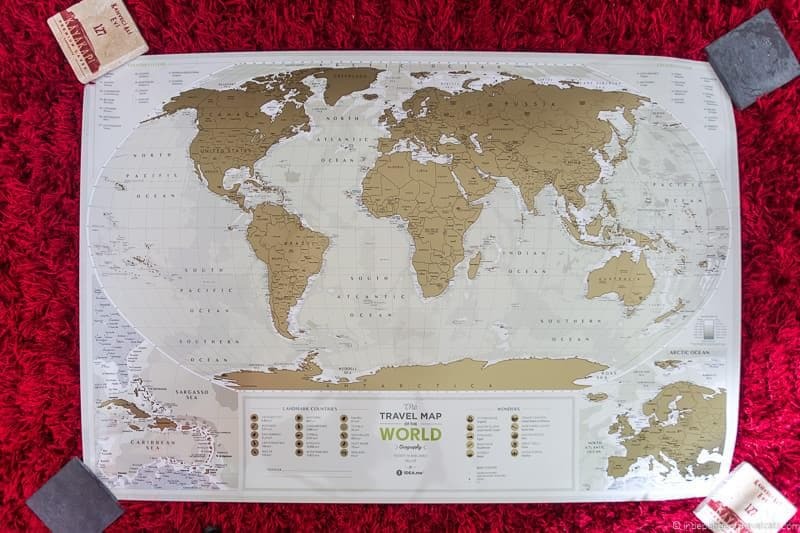 I love travel themed home decor because it’s a reminder of how big the world is and it also inspires me to want to explore and travel the world. 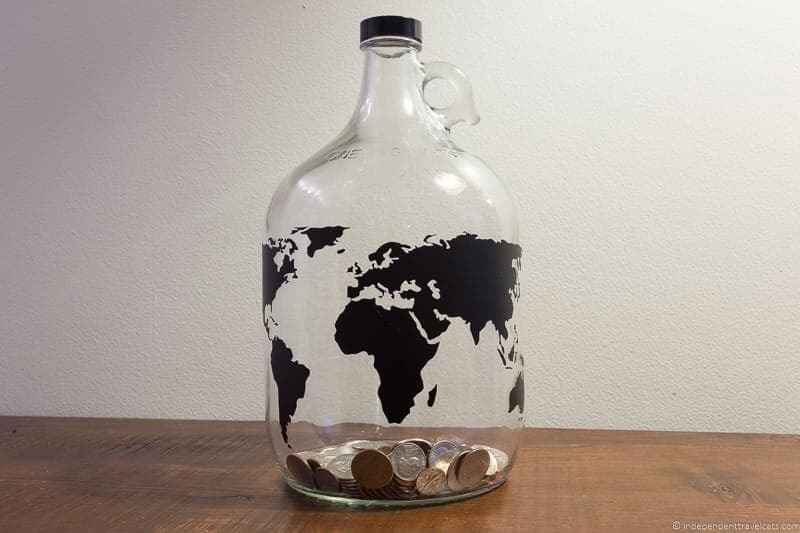 I am loving the World Map Money Jar, this is something I could really use to help us save money for traveling. Because travel themed decor is a great idea I haven’t seen before. I like the Travel Fund Jar! I like the world wooden map, the scratch off travel map, and the color changing mug! So cool! I love how these items are travel related and so unique. They are all very cool items. My first favourite would be the Travel Map Pin Board! I love travel-themed home decor to remind me of all the cool places I’ve visited and for the memories! My favorites are Nautical Shower Curtain and the RVing Kitchen Towel! I love travel themed decor because It gives a home a vibrant look. 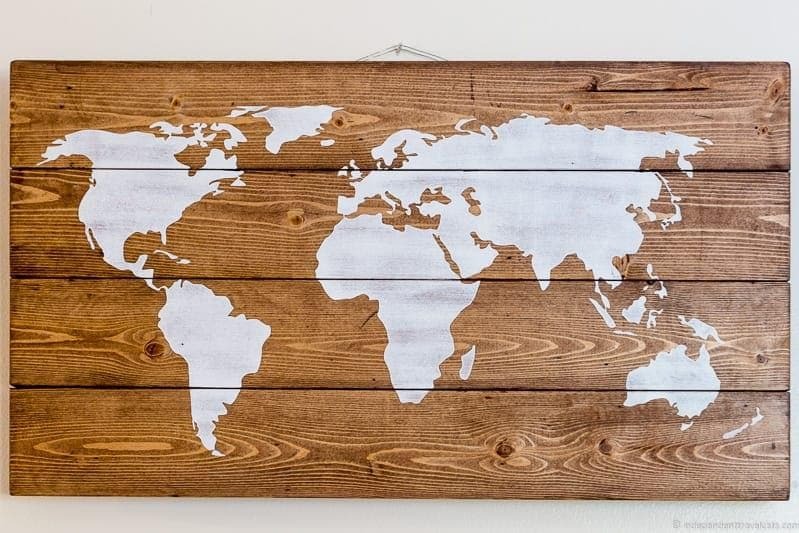 I like the world map wooden sign the most, it looks amazing. This post is so much fun!!! We actually own 2 of these… the map pin boards (which we got one year for our girls) and the scratch off map (which my daughter got for my husband). We always had fun moving the pin to our “next planned destination.” My husband loves maps, and these are terrific gifts. I recently received coasters from a friend that have outlines of areas in the city where we both used to live. 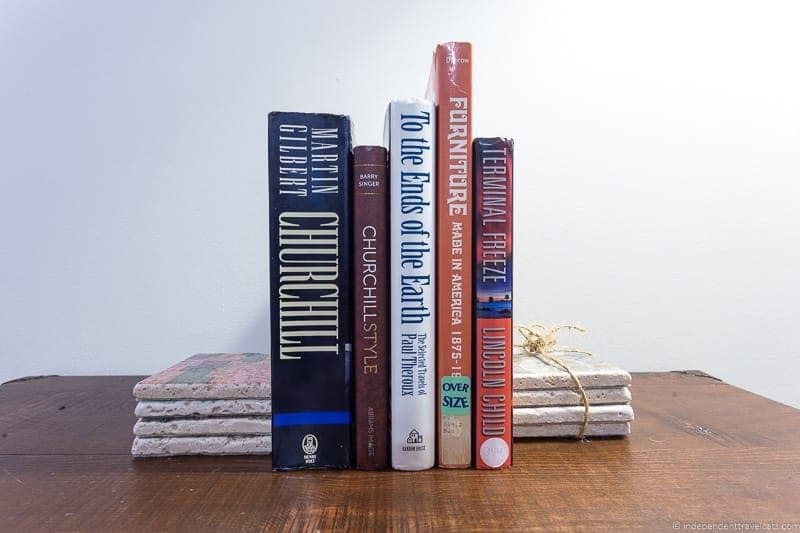 I loved it… these are perfect gifts for the traveler in your life! I love maps and have always been fascinated with them. It’s a reminder that, contrary to what the little song says, it is NOT a small world after all. The Wooden World Map is gorgeous! I really, really like that World Map Wooden Sign. The other stuff is neat too. Travel themed items are a great way to show a love for the places you’ve visited. Thanks. These are all such neat ideas! I especially loved the travel tree and I’m sure it’s something I’d decorate my house with. I do love travel themed home decor. 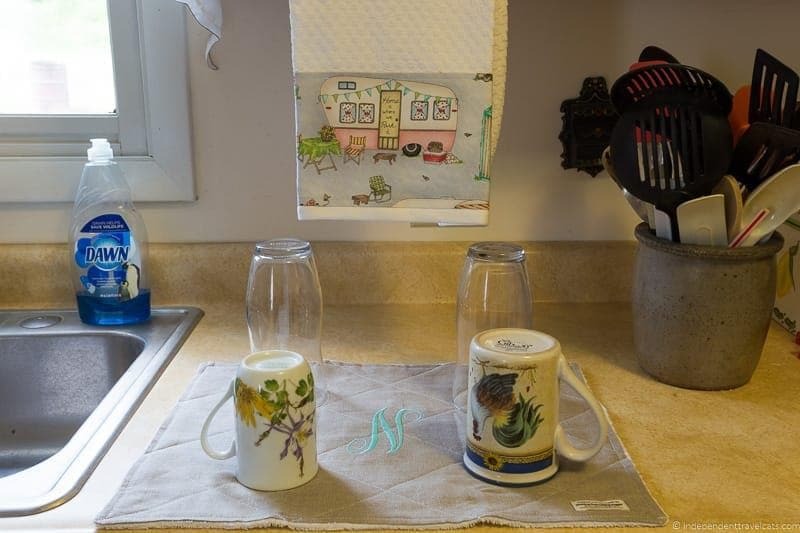 Favorites include the map of Ireland flower pot, the color changing mug, and the RVing kitchen towel. I have not had an opportunity to travel, but, I dream of beautiful places. I want to go to Italy and Greece. I also want to travel Europe to look at castles (ruined and restored). My favorite is the Travel Tree!! Such nice stuff! I just think it looks great and inspires. We are due in September and doing the nursery in travel themed decor! I like the maps for the walls and the glass money jar. 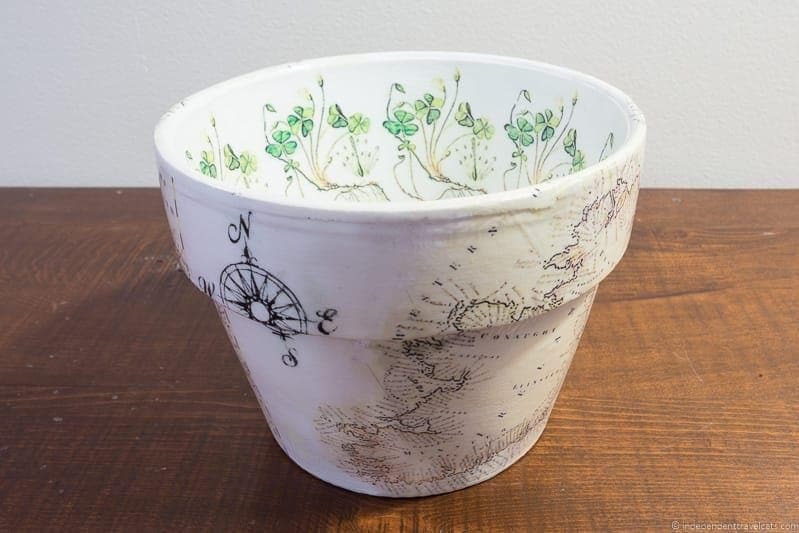 I like things that I can use, so I would choose either the Vintage Map Flower Pot or the themed candles. Sooooo many fun items!!! Especially love the Nautical Shower Curtain, Map Pencil Holder, & World Map Wooden Sign, Travel Tree Tree Starter Kit, Atlas Letter Envelopes, & Color Changing World Map Mug Whew! I love maps! I especially like vintage or old style looking map art, and we plan to theme one room in our house with maps/globes/etc. My favorite is the scratch off map, that’s fun and unique. Wow so many great products. I think my favorite is the travel tree. It is so unique and I love the idea. It’s funny when I see signs like that on my travels I usually take a picture, there is just something about it. 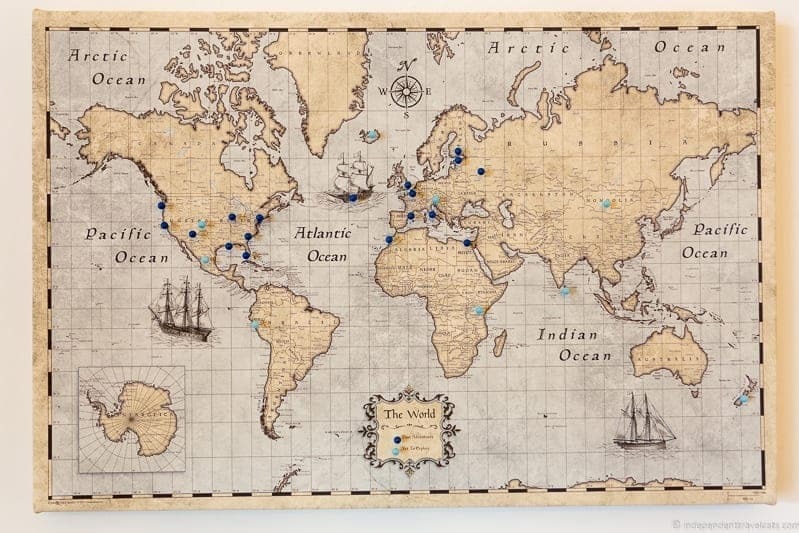 I love travel themed decor because I love the look of it, especially maps and globes. I love to travel it’s the best ever and traveling with people you love. I’m loving the photo blanket that you can treasure forever and pass it down to your kids. Travel home decor remind me of all of the wonderful places that I have visited and where I still would love to go. I’m loving the Wooden Map sign! I have the perfect place in mind! Hi there!! I love many of these treasures, mainly because I find them inspiring. Having travel related decor in your home,reminds you that there’s a whole world waiting for you to explore!! I love travel themed home decor because it reminds me of all the wonderful places to travel. I love the Map Fridge Magnets, the Hawaii Vacation Photo Frame, and the Zion National Park Lampshade. Makes great conversations for when your guest visit. I love the coasters the best. i love maps! and new places, new people, new cultures…i loved the money jar, but nearly all products are pretty awesome! I love all of these products! Such great gift ideas, but I also want them all for myself! 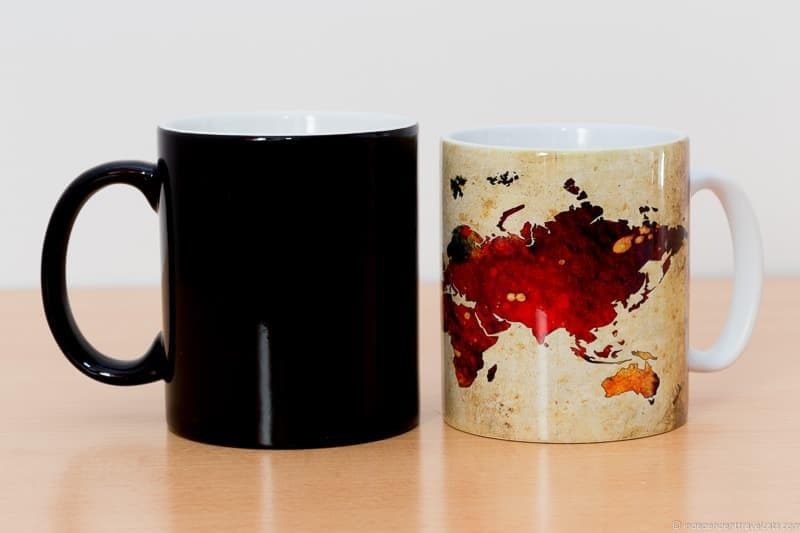 I really like the Color Changing World Map Mug. Oh my gosh, so many of these Items are amazing…I want them all! This is the coolest collection of travel items I ever seen, great job putting it together!! I love the decor because it’s so inspirational. Gives you the travel bug/itch immediately. I love the travel themed decor because it makes me want to explore the world and appreciate the beauty. The beautiful blanket is my favorite item. I would love to see pictures of my family’s most recent Disney trip on one of those! I love travel themed home decor because it makes me want to put on my travellin’ shoes and go, go, go! My family is from ireland so I love the planter pot. The luminaries I use to remember lost family members. I love how the decor makes you really feel a part of something bigger, the whole wide world. It’s hard to choose a favorite. I love the world map wooden sign the most. I like the travel decor as I save up a piece of memory by getting a souvenir where ever I go. I love travelling and have lots of items from my travels to remind myself of all the places we have been to. I really love the wooden sign – it would look perfect in my home. I like travel themed home decor because it reminds me that there is more to see out there than my four walls. I like the shower curtain and bath mat. I like personalized items and useful items the most. I like the candle a lot because we go through candles so quickly here and that one sounds like it has a lovely scent. I like travel themed home decor because it reminds me of previous trips and inspires me to go on new travels. I especially like the Personalized Photo Blanket and the shower curtain. I love the wooden map sign because it looks like it will last for a long time and I love to decorate. Traveling is my favorite thing to do (besides walk my dog). Loved lots of them! But especially two that weren’t for the giveaway – the Travel Map Pin Board, and the Luminary Bags – just lovely! I love having little beautiful reminders of the places we’ve visited and enjoyed. 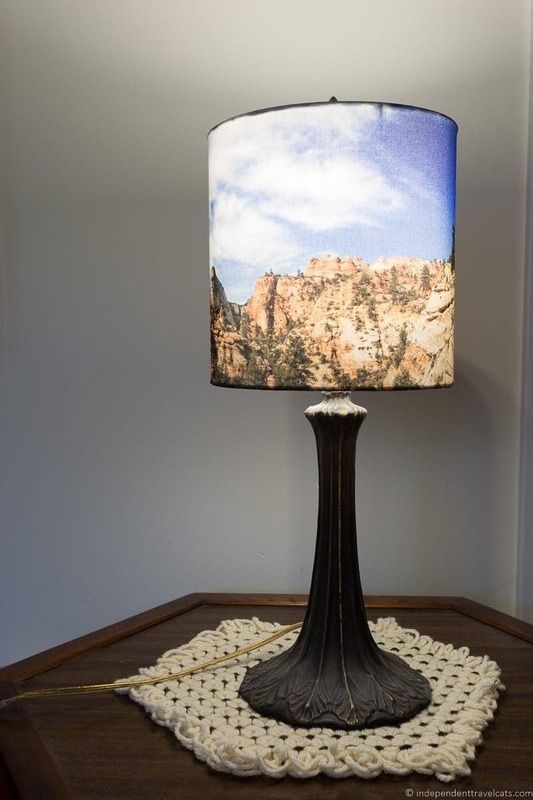 My favorite is the Zion National Park Lampshade. Traveling is very important to me and my family and I like my home to reflect our love of travel and places we’ve been lucky to get to or want to get to! I love travel decor because it inspires me to adventurous. I do love the World Map Money Jar. All that spare change adds up to more trips! I love photo decorations and travel decorations. I love to see different places and to bring that to my home would be so comforting. i love travel decor because it keeps me inspired and gives me the drive to save towards going to exotic places!